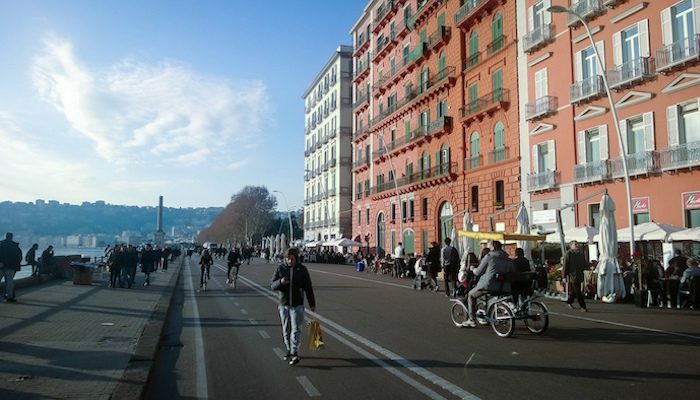 The Lungomare, a waterfront path along the coast of Naples, is by far the most popular spot for outdoor recreation in the city. The promenade features a flat concrete multi-use trail that runs along the length of Via Francesco Caracciolo/Via Partenope. While much of the road is runnable, the best section is a roughly 2.5 mile (one way) stretch between Fontana del Sebeto and the Molosiglio Gardens. This area is loved for its cool seabreeze, great people watching, and views of Mount Vesuvius. For extra mileage, add in a few loops of Villa Comunale, the green ‘City Park’ which features numerous paths, monuments, and museums. It’s about 1.5 km from end to end.